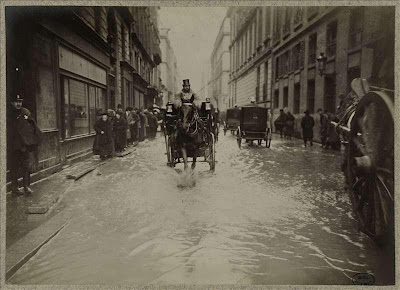 Paris, 1910 At The Onset Of The Flood. One of the world's most uniquely beautiful cities is nearly destroyed by a catastrophic natural disaster. Images of entire neighborhoods under water, desperate residents struggling to survive, and landmark buildings swimming in swirling water hit newspapers around the globe. Sounds like New Orleans under seige by Hurricane Katrina, doesn't it? But this description also fits Paris in January 1910. The Bibliotheque Historique de la ville de Paris has opened a new exhibit of over 200 photographs, postcards, maps, and newspapers documenting a time, exactly 100 years ago, when it looked like the whole world might have seen Paris for the last time. 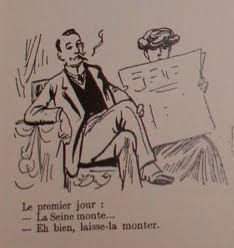 A 1910 Political Cartoon: "The Seine is rising. Oh, well Let it rise." 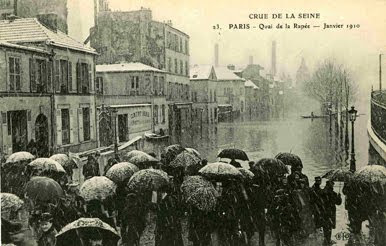 Summer of 1909 had seen record rainfall in Paris, and Winter that year was even wetter. 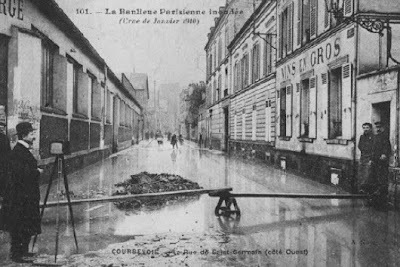 By mid-January 1910, it was obvious the river Seine would flood, and the government began taking steps to shore up its banks. An American in Paris at the time noted the disinterest of the citizenry: "As a matter of fact, the concern of the people was so slight that many of them appeared to treat the activities of the government engineers in strengthening the river banks as something like a joke." It turned out the joke was on them. As Flood Waters Rise, Communication Becomes More Difficult. 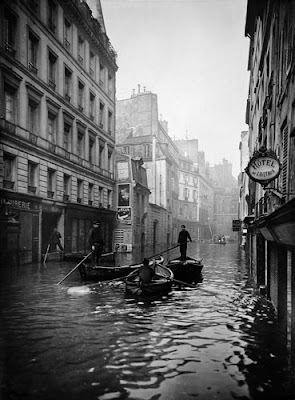 On January 22, 1910, Parisians noted with horror that the Seine had risen six feet above its usual level. But there was an unseen problem beneath the river, too. Paris's sewers, lauded as a wonder of modern engineering, along with recently constructed subway tunnels, became perfect conduits for enormous amounts of water. The volume of runoff from the areas surrounding the city was so large it created a second underground river. Once the subterranean waters combined with the rising Seine, Paris was deluged from above and below. Within six days the river crested at a full 20 feet over its banks. The Flood Steals The Life Blood Of Paris: Wine. As the streets flooded, debris began washing through the city. One contemporary eyewitness reported: "Crowds had gathered on the embankments, admiring the headlong rush of the silent yellow river that carried with it logs and barrels, broken furniture, the carcasses of animals, and perhaps sometimes a corpse, all racing madly to the sea." 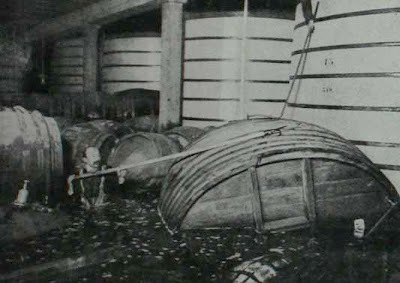 Barrels of wine, washed out of underground cellars, were a prize catch for those daring enough to attempt to haul them in. As the waters rose to their highest point since 1658, more and more of the city was submerged. Of Paris's 20 arrondissements, 12 were flooded. 20,000 buildings were totally destroyed in one week's time, and 200,000 were left homeless. 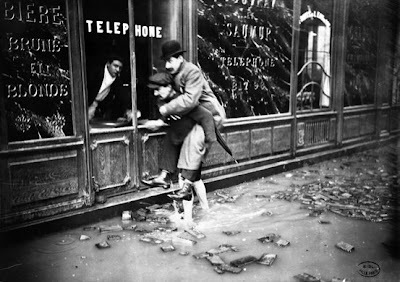 As word of the disaster reached the outside world, Paris was deluged once more, this time by photographers. A brisk business in penny postcards documenting the destruction sprang up overnight. Wealthy Parisians and gawking tourists found entertainment in the city's newly formed "canals," and began hiring boatmen to ape the gondoliers of Venice. Poet Guillaume Apollinaire wrote: "On Avenue Montaigne people organized pleasure tours by boat. For two sous, you pass by the smartest hotels and photographers will take your picture as a flood victim for the sum of 50 centimes." The flood was one of the great visual stories of the early 20th century, and the first natural disaster to receive the full attention of the modern news media. "Gondoliers" Sailing Past Swanky Hotels On the Rue de Seine. For some, the submerged city became a carnival. But for the poor of Paris it was anything but a lark. Miraculously, only one disaster-related death was reported in Central Paris, a soldier attempting to rescue a stranded family was swept away by rushing waters. But the outlying areas, the unfashionable neighborhoods of the working classes, were not so lucky. The number of casualties there, and the identities of the victims, remain uncounted and unknown. Total property damage was an estimated 400 million francs, or approximately $1.5 billion in today's U.S. dollars. The entire city of Paris was changed from a modern metropolis to a 19th century village overnight. Outmoded horse-drawn carriages served as public transit, and 75,000 horses were pressed into service. The Paris Metro, only three years old, was inoperable for 3 months. Le Figaro reporter Georges Cain observed: "Here we are, gone back in time 20 years. No electricity, no elevators, no telephones and it seems unbearable to us." The City Takes A Trip Back In Time. The Library's exhibit is a remarkable piece of history, but it may also serve as a warning. One expert consulted by the curators, environment director for the Ile-de-France region Louis Hubert, says every year there is a 1 in 100 chance of a similar flood engulfing Paris. It is not a matter of if, but when. Over the past century, Paris has found ways to protect itself from flooding of 1910 proportions, but not completely. The greater Paris basin is in some ways more vulnerable today than it was a century ago: 10 times more people live in the flood zones, and a new underground infrastructure, built since the 1910 flood, could create an even more damaging subterranean seaway. 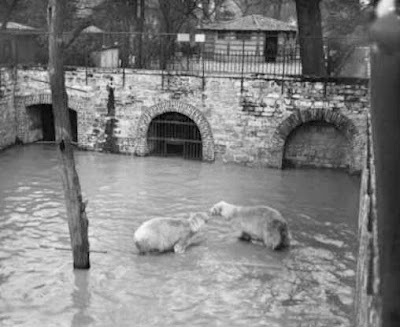 Flooding At The Paris Zoo. Tabloid Reports Claimed Crocodiles Were Seen In The Seine. The library exhibit, Paris Inonde, 1910, at the Bibliotheque Historique de la ville de Paris opened on January 8, 2010 and continues through March 28. An interactive map at the library allows visitors to take a virtual tour of some 300 streets that were flooded. The same database is available online for those unable to visit the City of Light. Also, a well-reviewed book on the history of the 1910 Paris flood was published in January 2010 by Palgrave Macmillan. Jeffrey H. Jackson, a professor of History at Rhodes College, is the author of Paris Under Water: How the City of Light Survived the Great Flood of 1910. Considering the recent events in Port-Au-Prince, perhaps these histories of a past natural disaster will serve as reminders that a century later we remain at the mercy of Mother Nature. Who the Heck is Herwart von Hohenburg? New Reality Show For Book Readers? Is This The Rarest Color-Plate Book Of All?